Lot:1355 1900-S Barber Dime. MS-65 (PCGS). CAC. 1900-S Barber Dime. MS-65 (PCGS). CAC.，Speckled olive-copper iridescence drifts over a base of warm antique silver patina on both sides of this wonderfully original Gem. 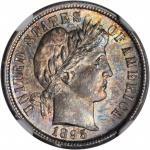 Sharply struck and carefully preserved, this is a conditionally scarce survivor of the heavily circulated 1900-S Barber dime issue. 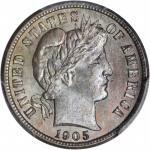 The most readily obtainable San Francisco Mint Barber dime produced up to that point, the 1900-S is still rarer in Mint State than such later date issues as the 1905-S, 1911-S, 1912-S, 1914-S and 1916-S. Ideally suited for inclusion in a high grade date set, this piece would do equally well in an advanced mintmarked type collection.，PCGS# 4823. NGC ID: 23EE.，PCGS Population: 22; 22 finer (MS-67 finest).，From the Frog Run Farm Collection.